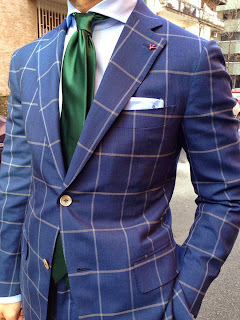 What are your considerations when you want to purchase a tie? Price, color, pattern, width, and designer brand usually get more attentions. However, tie’s construction could be a very important factor. In general, there are many types of tie, today I’d like to introduce you the most classic and luxurious tie: seven-fold tie. Unlike most ties, which are made with some pieces of fabric sewn together, the true seven fold tie was constructed from one large piece of silk, which was unlined and accordion folded in on itself 7 times. The edges are hand-rolled and hand-stitched. It is emphasized on all handmade process and pure silk material. That’s why seven-fold tie is so impeccable; it has a thicker feel, incomparable drape, a larger looking tie knot, and a more hefty weight. Labor intensity and quality of material drive the tie's high price, but a seven-fold shows its value when suitably worn. The lack of lining allows the tie to knot without binding and creates an attractive dimple that spreads luxuriantly down from the neck. It drapes perfectly and never takes on the awkward folds of a liner. Another great thing about the seven fold tie is that it has greater reflex than standard ties - meaning that when you untie your knot, the folds, wrinkles and creases with disappear much faster. There is something wonderful about handmade items and a a tie should also be handmade. As Oscar Wilde observed, “A well-tied tie is the first serious step in life,” everyone should have a fine tie to put their best foot forward. Also, a necktie is one of the few items through which a man can reveal his personality or mood, so make a smart choice when choosing your next necktie. At Utah Woolen Mills we are the only store in the state that carries 7 fold ties. Come in and check out our collection from Brioni, Robert Talbott, Dolce Punta, Italo Ferreti and Isaia!